The cotton fiber is the king of textile industries. In all over world people like to cotton fabric. It is the oldest fiber used for textile purpose. Now cotton is cultivated in most every country in the world having a mild climate, suitable for cotton cultivation. American cotton dominates world market. In other countries, large producers of cotton are India, Egypt and China. There are many different quality of cotton fiber the different in quality is expressed in grading and staple length. The grade is determined from the color, trash content and quality of ginning. Best cotton is only white color best continued exposure to light and weathering cause white cotton loose is whiteness. The color groups present in cotton are white; Light spotted (Lt.Sp), Spotted ( Sp), Tinged ( Tg), Yellow stained (YS), Light grey ( Lt. gray) and gray (gray). The trash includes such material as Leaf, stems, seeds, shale, motes, grass, sand, oil and dust. The cotton which contain minimum amount of trash after ginning are those with the highest spinning value. Depending upon the trash content cotton can be graded. In practice, the grading of cotton indicates the trash and color of cotton like Lm TG, or Mid Lt gray. After ginning process cotton found neps and naps. Neps Means: Small tangled knots of fibers that are visible as dots. This type of cotton is nappy cotton. Naps Means: Large clumps or matted masses of fiber which produce rough appearance. These types of cotton are nappy cottons. Gossypium Herbaceum- Middle East, Egypt, India. Gossypium Barbdense- Peru, Egypt and Sea Islands. Gossypium Hirsutum- America and West Indies. 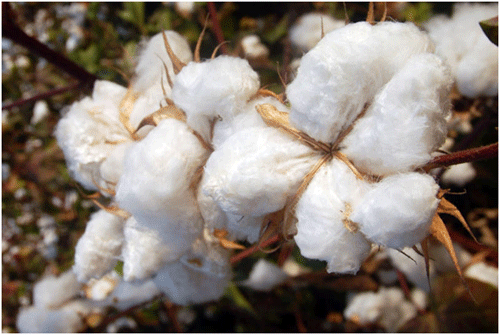 Sea Island cotton-The botanical name is gossypium barbadense. Found in U.S.A., Carolina, Georgia and in the Islands. If has long, fine, soft and silky fiber. The staple length is around 5cm or more. Colour is light creamy tint. EGYPTIAN COTTON: The staple length is 3.7 to 4.5cm. These fibers are also long, fine, soft and silky. These are found in Egypt and Middle cost. BRAZILIAN COTTON: This cotton is produced in Brazil and Peru. The staple length is 2.5 to 3.8 cm and color is dull white to cream and some cotton is dull golden. The fiber are harsh and wiry to touch but elastic. AMERICAN COTTON: American cotton is growing in U.S.A. and in the South of North America. The staple length is generally 2 to 3 cm. INDIAN COTTON: This is produced in India; the staple length is 1.5 to 2.5 cm long. The color is generally white. CHINA COTTON: This is produced in China. The staple length is very small like 1.2 to 1.8 cm It cannot be used for fine quality of fabrics. Sea Island Cotton- 5cm or more. What is the difference between organic cotton and conventional cotton? No use of synthetic fertilizers. More whitening to safe ᴴ²O² use.